Powerful New York City correction union boss Norman Seabrook was arrested Wednesday and charged with taking a $60,000 cash kickback from a hedge fund stuffed into a Ferragamo bag in charges with links to probes of Mayor Bill de Blasio’s fundraising. Seabrook, according to a complaint filed in federal court in Manhattan, took the money in an $820 bag from his favorite fashion store in return for steering $20 million in union pension money and general funds to Platinum Partners, a hedge fund. Both Seabrook, the union’s head for 21 years, and Platinum founder Murray Huberfeld, were charged with conspiracy and honest services fraud. The complaint also said an unnamed intermediary — whose description matched Brooklyn real estate investor Jona Rechnitz, a de Blasio fundraiser — has pleaded guilty and is cooperating. Manhattan U.S. Attorney Preet Bharara, who has ongoing investigations of de Blasio’s fundraising and Rechnitz’s role in a gifts-for-favors scandal at the NYPD, said Seabrook had “sold himself and his duty” to protect members’ retirement money, and said the case reflected pervasive political corruption in New York. Alan Levine, a lawyer for Rechnitz, declined to comment. Sources previously revealed that Rechnitz underwrote trips by Seabrook that were attributed in the complaint to the cooperator, and The Associated Press said two sources confirmed he was the cooperator. The charges Wednesday echoed a civil suit filed in 2015 by William Valentin of Medford, a former corresponding secretary in the union, that first raised questions about the hedge fund investments. 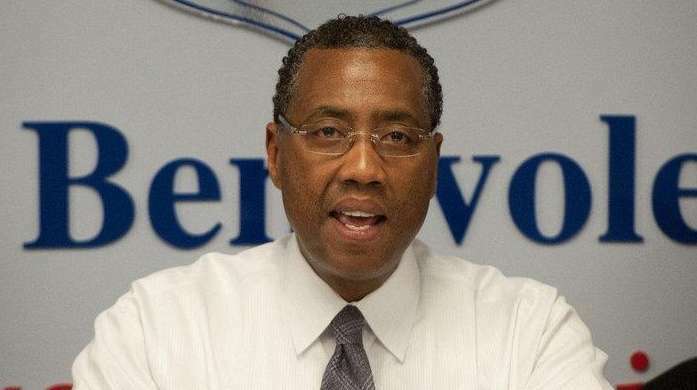 The criminal complaint sworn out by FBI Special Agent Blaire Toleman said Seabrook’s clout in the 9,000-member Correction Officers’ Benevolent Association gave him the power to control roughly $81 million in pension assets and $12 million in general funds. Rechnitz allegedly took him to the Dominican Republic, Israel and Las Vegas, accompanied by an NYPD official who introduced them, and on one trip in late 2013 Seabrook complained to Rechnitz that he worked hard investing union money and got nothing personally. “Seabrook said that it was time that ‘Norman Seabrook got paid,’ ” according to the complaint. Rechnitz and Huberfeld allegedly used a phony invoice for Knicks tickets — billing full price when the team was 4-24 — to pass $60,000 from Platinum to Rechnitz, and he gave the money to Seabrook in the Ferragamo bag Dec. 11, 2014. But Seabrook was angry because he expected $100,000 to $150,000, the complaint said. Bharara, at a news conference, noted that a search of Seabrook’s home Wednesday turned up 10 pairs of pricey Ferragamo shoes and a bag from the luxury store matching the description, but Shechtman dismissed the evidence. Bharara said the Platinum Fund was losing investors at the time it got an infusion from the union money, and the $20 million made the union the fund’s largest investor. But he said prosecutors don’t yet know if there were losses. City Hall said Seabrook would be immediately suspended from his job as a corrections officer. De Blasio, who was endorsed by Seabrook and once praised him as a “great leader” but also has clashed with him over reforms at the Rikers Island jail, said the charges were serious. De Blasio also was asked about Rechnitz, the contributor who has surfaced in three separate city corruption investigations.